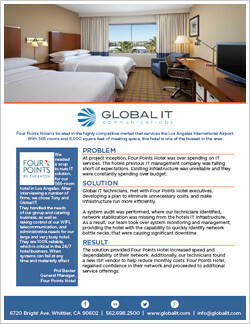 Hospitality tech support is increasingly required to provide rapid results for hotel customers. Hotels, restaurants, and retail companies must provide a consistent and positive experience for customers across all operations from online, call centers, security, and in-house. Hospitality tech support is a prerequisite to providing a seamless experience for customers. 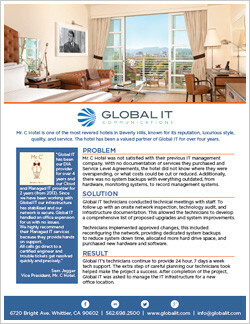 Global IT has connected a range of businesses through facilitating communications, networking, and security. Improve your efficiency in responding to customer needs by using reliable IT solutions that enhance the hospitality experience. High quality 24/7 service with technical support, phone services, and high-speed internet available for customers nonstop around the clock. Increase efficiency and reduce costs with technology planning, vendor management, upgraded hardware and computer security. Global IT Communications network infrastructure solutions enable our clients to implement new technologies, increase efficiency and align their infrastructure with their business goals. With today's instant communications access requirements, organizations will find it difficult to be productive without some type of reliable wireless connectivity. In today's busy and demanding communications environment, creating a well-engineered wireless infrastructure tailored specifically for uptime and speed is a must. From tourism and hospitality, to amusement parks, ski resorts, warehousing, high end residential or the local coffee shop, Global IT can engineer the right solution to meet any wireless need. There are many important details to consider when planning adding wireless access points to a business or high end residential Wi-Fi network. Global IT wireless and network design teams will provide end-to-end consulting and installation through ought the process of selecting the appropriate hardware, procurement, cabling, installation, configuring and testing prior to going live. Our service begins with our design Engineers conducting a thorough site-survey at the location. 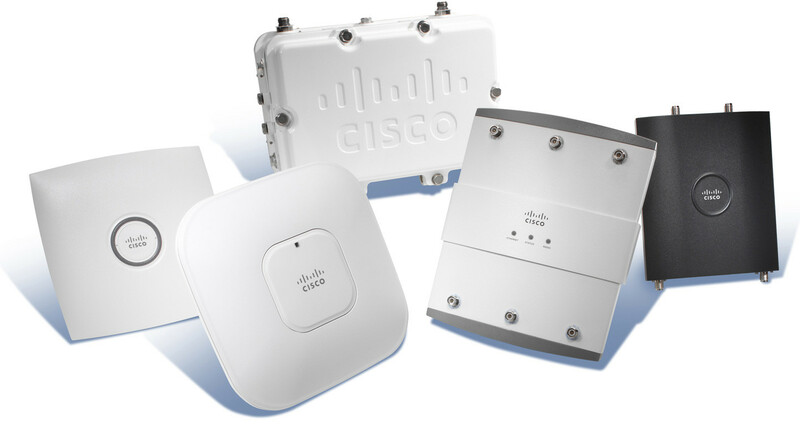 Once complete, we suggest the ideal locations for wireless access points to maximize coverage zones, ensuring the highest quality of service for your voice, video and data communications. With our new Smart Wireless technology, we're able to achieve a level of efficiency that basic wireless devices cannot. Smart Technology can deliver reliable Wi-Fi connections with longer range that extends past traditional wireless obstacles. It is designed to mitigate interference and focus RF (Radio Frequency) signals to where it's needed. This ensures maximum coverage and consistent performance at longer ranges and reliability of connection. The hospitality industry is increasingly relying on technology to provide rapid results for customers. Hotels, restaurants and retail companies must provide a consistent positive experience for customers across all operations from online, call centers, security and in house. Global IT has connected a large range of businesses through facilitating communications, networking and security. If you are interested in improving your organizations ability and efficiency when responding to customer needs, trust reliable Global IT solutions that enhance the hospitality experience. High quality 24/7 service with technical support, phone services and high speed internet available for customers nonstop around the clock. Managing the many 3rd party vendors related to IT can be a task in itself. How do you track and confirm their work, returns (RMA), invoicing, credits, and scheduling with other parties? Vendor and customer communication is often broken down through translation resulting in lost confidence in the ability to complete tasks, delays, and unsatisfactory customer service. With our hundreds of customers, our technicians and administrators are accustomed to the many moving pieces within the diverse organizations. Highly trained employees and and internal ticketing systems track and help hold vendors accountable for their tasks, and verification can be made by Global IT personnel. Expert experience: With the understanding of vendor pricing, Global IT brings a broad perspective on pricing and negotiations. Our approach always reduces client spending returning profits to the establishment.